Fort Lewis College students look up at family and friends during the Spring Commencement Ceremony on Saturday in Whalen Gymnasium. 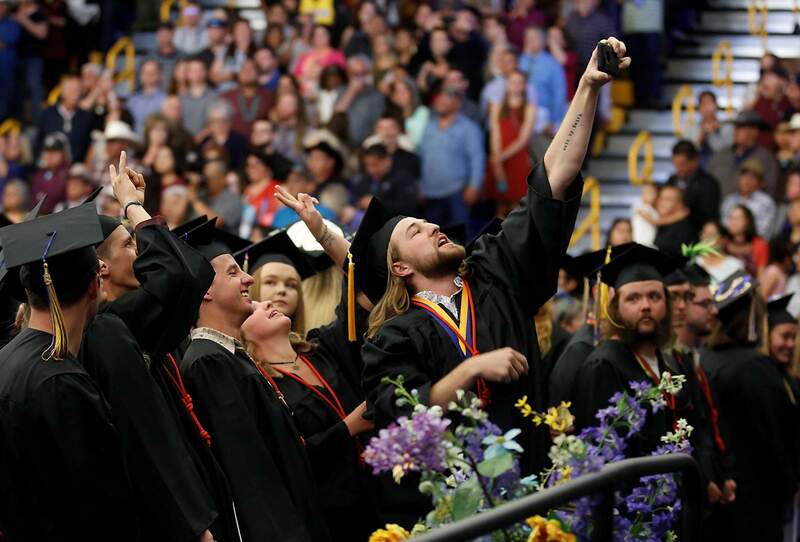 Lots of selfies were happening at the Fort Lewis College Spring Commencement Ceremony on Saturday in Whalen Gymnasium. 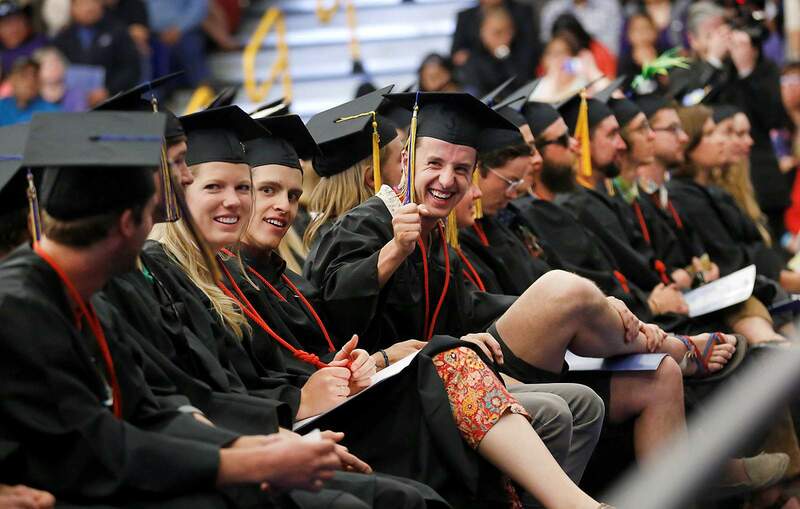 Excitement and energy filled the room during the Fort Lewis College Spring Commencement Ceremony on Saturday in Whalen Gymnasium. Gov. 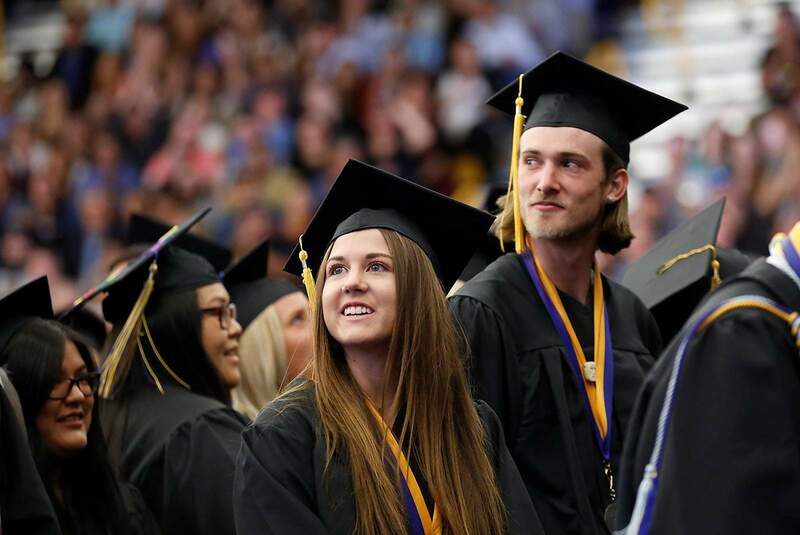 John Hickenlooper told graduates at Fort Lewis College’s spring commencement “to feed your dreams, not your nightmares” as they face challenges and setbacks in life. Saturday’s commencement ceremonies in Whalen Gymnasium, held in two sessions, was more dream than nightmare as 485 students capped four years, sometimes five or six, of striving to get the 120 credit hours needed to leave FLC with a Bachelor of Arts or Science. 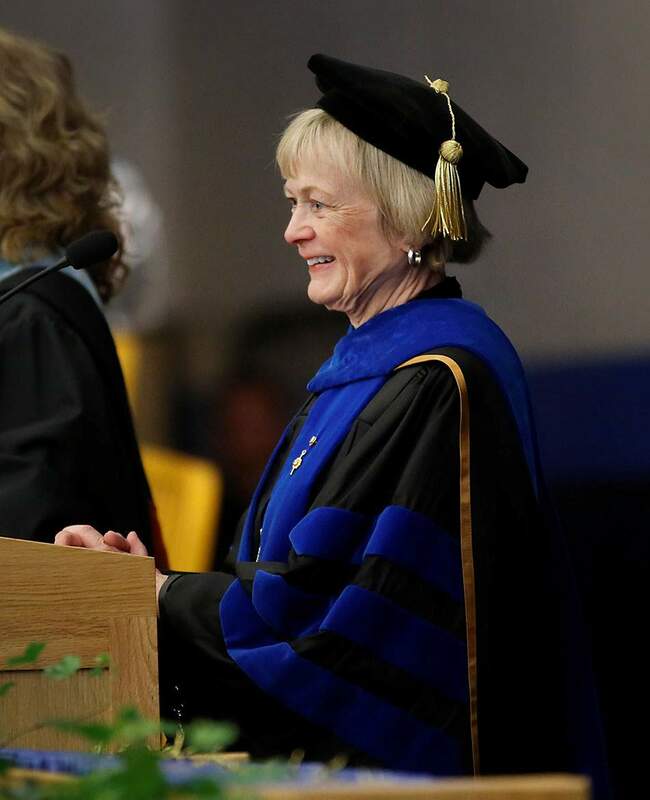 Applause frequently greeted students as their names were called and they were greeted by Fort Lewis College President Dene Kay Thomas, who will retire on July 31. Kimberly Clay, 22, a political science major, graduated Saturday at Whalen Gymnasium at Fort Lewis College. She jokes with her family that she is “Navajo Nation president, 2034.” She plans to enter law school. 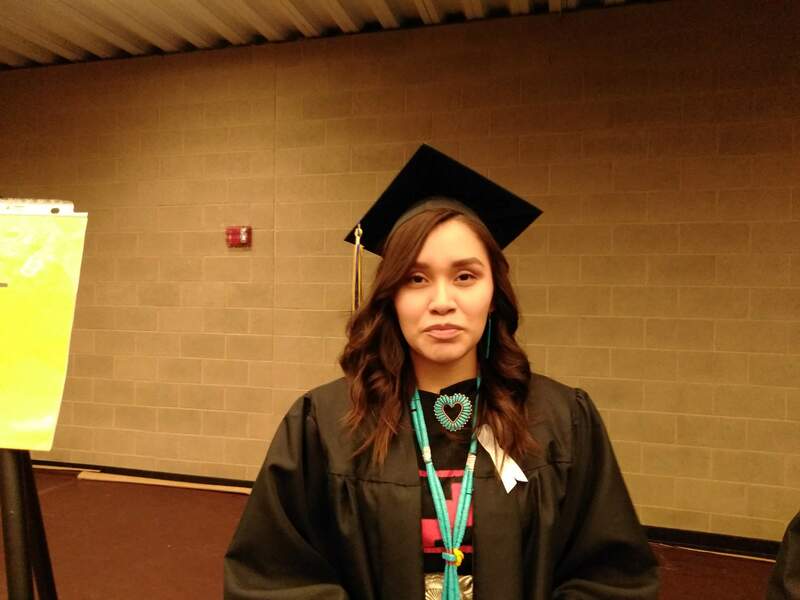 Kimberly Clay, 22, from Window Rock, Arizona, who graduated with a degree in political science, said she was inspired by FLC professors because they catered to students’ interests, and she plans to apply to law school. Eventually, she said she would like to work with the Navajo Nation, especially because there are few women working at high levels in Navajo tribal government. “I joke with my family that I am Navajo Nation president, 2034,” she said. Other students, such as Brandon Book, 22, an accounting major, will be entering the workforce. He said he would return to his hometown, Denver, and begin looking for a job in his field. FLC President Dene Kay Thomas delivers her last commencement address as president to students during the Spring Commencement Ceremony on Saturday morning. Thomas is retiring at the end of July. Thomas praised graduates for winding their way through academia. “You faced past difficulties, but you did not lose sight of your goals,” she said. Hickenlooper labeled himself “the last person who should ever be delivering a commencement address” as he suffers from dyslexia and has a mild version of attention-deficit disorder. However, he said his rise to the top elected official in Colorado illustrated how failure can be converted to learning – and eventually to success. Gov. 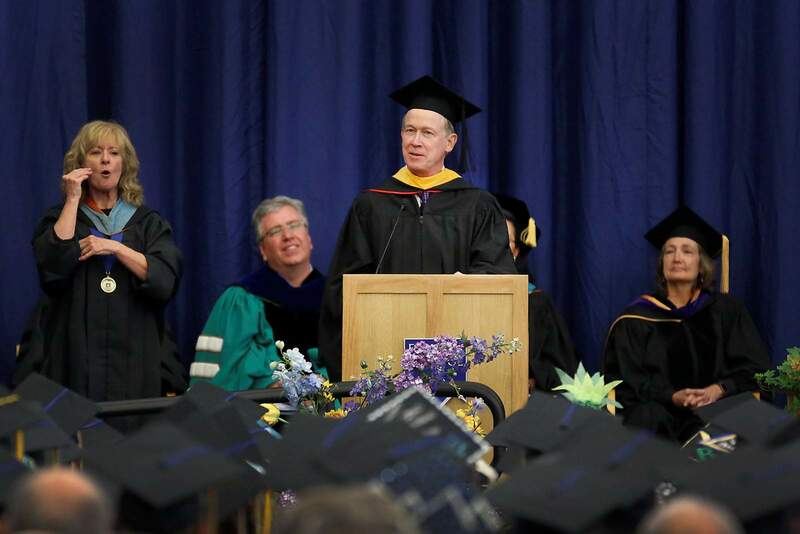 John Hickenlooper, this year’s commencement speaker for the Fort Lewis College Spring Commencement Ceremony on Saturday morning, delivers a speech to the graduating students in Whalen Gymnasium. “It took me, and this is the truth, it took me 10 years to get my undergraduate degree and my master’s in geology. They actually gave me tenure as a student,” he said jokingly. He said he learned many things. The key lesson he said, “I learned how to learn.” And he credited that with allowing him to become a successful entrepreneur. He tried to be a housing renovator, a real estate developer and, as a geologist, he came to Colorado and got laid off within five years. But through it all, he never quit. His failures and successes in school, he said, gave him the confidence to use money from his severance package after being laid off as a geologist working in the oil industry to start the Wynkoop Brewing Co. in downtown Denver. But Hickenlooper said persevering through failures had taught him to believe in his dreams and ideas no matter the odds. The same lessons, he said, allowed him not to lose confidence when running for mayor of Denver, even when he was frequently behind by 10 to 15 points in the polls. He won his first election for mayor with two-thirds of the vote. Lisa Bartley of Boulder, waiting outside Whalen Gymnasium, for her son, Michael Bartley, who received a degree with honors in environmental science and Spanish, said his progress through FLC had been fairly “low key” as he was her third child to obtain a college degree. Hickenlooper agreed Durango is a nice place to spend four, five or even 10 years on the winding path of academia. “Where else can you take in a Snowdown, hike the Hogsback, rock climb Turtle Lake, kayak the Animas, paddleboard the Haviland or hang out on the rim on hammocks? I clearly went to the wrong college,” he said.